Smartphones have evolved from just ordinary touchscreen multitasking devices to advanced personal assistants and addictive electronic/digital companions. Your device might be the fastest device in the world to you because it works pretty well, you are used to it or it just hasn’t lagged yet. Well, that’s true to some extent. what actually makes you feel or know your smartphone is not worth the hype? 1. When a newer device from your brand is launched and you get to see it or go through it, that feeling of …. just creeps in. 2. When you find out that your friend’s smartphone has 15 opened tabs on Google Chrome and the browser is still rocking, while you are still waiting for the unfortunately Chrome has stopped message to close because you opened up to 7 tabs which were even very slow. 3. Oh, playing HD games on different devices could just spell out the truth about how fast a device is. Slower devices tend to take more time to even load the game completely, let alone doing the real job. If you haven’t used a high end flagship device from manufacturers like Samsung, HTC, Huawei, Google, LG, Xiaomi and Apple, you wouldn’t really understand what it means for a smartphone to be fast. By the way, if a smartphone isn’t up to par when it comes to speed, then, it’s multitasking and other features would be so boring and easily evitable.Most people don’t really care about the speed of their devices or the device they are going to purchase, they just want to be sure the phone responds to touch. about is that the app I clicked should run open. You might not buy the fastest smartphone currently trending, but using a fast smartphone keeps you on track, saves time, battery and a even does a lot more. We will probably talk about that in a jiffy. CPU Chip makers etc, are mostly working on producing faster CPUs that are very small in size, consumes less battery, doesn’t heat up and have the best photo features,capabilities for the modern era of photo devotees. I see you are ready to know the fastest smartphones in 2017 and how they work. If you haven’t used a phone more expensive than yours, maybe bigger and newer, you wouldn’t understand what it means for a smartphone to be fast. All smartphones are fast based on user preferences, but the fastest are there. More devices will be added to the list to make sure everything is up to date. And now is the time to start talking about the fastest, yes I mean the fastest smartphones in 2017.
iPhone X If you have any personal issue with Apple, please put it aside and rejoice with them because these guys have done a remarkable job and it’s worth talking about. The iPhone X or iphone 10 actually takes the place of #1 on this list of the fastest smartphones in 2017. But, is it true? Let’s dig deep and wide. The iPhone X was launched when many high end flagship devices were already released and they were already feeling safe. The iPhone X was unveiled by Apple on the 12th of September and would be released on Friday, the 3rd of November, 2017. That’s some days to go. Now, back to the point. Apple actually relates the iPhone X to the future(Say hello to the future), and this indirectly tells you the awesome stuff it’s made of. The iPhone X runs on Apples latest iOS 11 operating system with the very best of optimization for speed, battery, camera, sound and video plus an overall better user experience. The iPhone X uses Apple’s most sophisticated and dynamic chip called the A11 Bionic CPU fastest smartphones in 2017 Apple iphone X The iPhone X is powered by the A11 Bionic chip It has a six-core CPU design which Apple claims is the smartest and most powerful ever seen in a smartphone(I don’t think it will ever be seen elsewhere). It works with the Apple-designed GPU, which has three cores and is capable of powering AR at 60fps, as well as enabling new machine learning and 3D games. The iPhone X looks stunning with a Super Retina 5.8inches OLED display that stretches across the entire front of the phone for an edge-to-edge finish. The screen has a million-to-one contrast ratio and wide color support, with HDR that supports Dolby Vision and HDR10. The display also has True Tone that will automatically adjust the white balance to match the environment. The iPhone 10/X ditches fingerprint sensors and uses Face ID to unlock the iPhone. On the storage front, the IPhone X is set to be available with storage of 64GB or 256GB, without expandable storage options. The iPhone X has one of the very best cameras in a smartphone. The back camera is a dual-lens 12Mp camera with support for OIS-optical image stabilization. One has an aperture of f/1.8, and the other f/2.4. A quad LED True Tone Flash with Slow Sync gives your photos a natural lighting. On the front of the phone is the /7Mp True Depth camera/ that works as a Face ID scanner and great selfie shooter. TheiPhone X battery will have a capacity of 2,716mAh With wireless charging via the Apple AirPower, there’s room to wirelessly charge your iPhone, Apple Watch Series 3 and your AirPods. The AirPower will be launching in 2018. And now, imagine these top notch features on a slow phone? It will be a so boring, battery killer and always heating up smartphone. So, what makes the iPhone X the fastest smartphone on our list of fastest smartphones in 2017. The iPhone X running on iOS 11.0 with 3GB RAM was spotted on Geekbench and it scored 4224 in Single Core & 10219 in Multi Core performance. That’s even higher than some old gen Quad core i5 Laptop processors & the Single core score is quite similar to the i7-7500U.Iphone x geekbench results fastest smartphones in 2017 And this alone should tell you the kinda speed that’s packed in that A11 beast-like chip. Although the iPhone X hasn’t been released yet, it’s got everything the future needs. Before you read on, I feel you should know how much the fastest smartphone in 2017/18 will cost. It starts at $999 / £999, and that’s for the 64GB model. For the 256GB model, it’s a whopping $1,149 / £1,149. Apple again! Yes, the iPhone 8 Plus deserves more than just the second position as the fastest smartphone in 2017. The iPhone 8 Plus is a kinda larger screen version of the iPhone X with more battery life and the same tried-and-true topnotch performance Apple has built its reputation on. The iPhone 8 Plus uses the same fast and furious A11 Bionic processor CPU Hexa-core (2x Monsoon + 4x Mistral) as the iPhone X, with a total of six cores and Apple GPU (three-core graphics). Its battery(non-removable Li-Ion 2691 mAh battery (10.28 Wh) is smaller than the iPhone 7 Plus but it is more power efficient, thanks to the A11 Bionic chip. The iPhone 8 Plus has two rear-facing 12-megapixel sensors cameras; one telephoto, and one wide-angle, with a 7-megapixels FaceTime camera on the front. The iPhone 8 Plus also adds bokeh effect to photos with a new feature called Portrait Lighting. Just like the iPhone X, it’s IP67 certified – dust and water resistant. fastest smartphones in 2017It also supports fast charging, it doesn’t use the OLED screen and has a resolution of 1080 x 1920. The iPhone 8 Plus is undoubtedly the fastest smartphone in 2017/2018 and it’s been proven. Here’s why the iPhone 8 Plus is one of the fastest smartphones in 2017. The Android flagship devices using the Snapdragon 835 chip like the Samsung Galaxy Note 8 scored very low at 6,564 even with its 6GB of RAM. The OnePlus 5 plus its 8GB of RAM and Snapdragon 835 went up to 6,542. In a 3DMark IceStorm benchmark test which test the graphic performance of a smartphone, the iPhone 8 Plus went extremely high up to 64,412 while the much hyped and powerful Snapdragon 835 powered Samsung Galaxy Note 8 was just 39,834. The difference is just so clear. Oh not again! Well, I can’t help it. The iPhone 8 just did it and it the job was well done. The reason the iPhone 8 takes the 3rd position on this list of the fastest smartphones in 2017 is pretty simple; it also uses the Apple A11 Bionic CPU and performs so well when put head to head against its Android rivals. The iPhone 8 comes with a 2GB of RAM alongside the monstrous A11 chip and has two variants, the 64GB and 256 GB internal memory. It’s powered by a 1,821mAh battery and has a 4.7 inches LED IPS screen at 750 x 1334 pixels. It also retains the physical home button too like the former. It features a 12MP primary camera and a 7MP secondary camera for selfies. It supports wireless charging and has a lot of similarities in the software front. This is the smallest among the three iPhones launch recently, and we are going to see how it competes and beats other top Android flagship devices. Galaxy S8+ in a real world performance test. They put the same 2-minute video,shot in 4K by a drone, on the iPhone 8, Galaxy Note 8 and Galaxy S8+, and then added the same transitions and effects before exporting and saving the video. The result is mind blowing.fastest smartphones in 2017 iPhone 8 vs Android Did you see actually see that? It just took the iPhone 8 0.42 seconds to do the job while the galaxy Note 8 struggled with a whole 3.03 minutes. Wow! The Galaxy S8+ even took more time, 4 minutes 7 seconds to get things done. That was a straight win and the iPhone 8 deserves the position it got as the 3rd fastest smartphone in 2017. * Tom’s Guide took the test a little bit further by using the two devices to open a 5.1 MB map illustration PDF file of 5.1 MB size via their stock file managers. It’s quite clear here who is faster. Let’s move on. And here comes the Sammy guy, the Galaxy Note 8. The Samsung Galaxy Note 8 is one of the fastest smartphone in 2017. One of the most striking/notable part of this device is its screen. The Galaxy Note 8 has one of the best screens currently on a smartphone with a gorgeous and incredible 6.3-inch Quad HD+ Super AMOLED (2960 x 1440) 521 ppi screen. The Galaxy Note 8 runs on Android 7.1.1 Nougat and is powered by the high end Qualcomm MSM8998 Snapdragon 835 chip which powers most flagship devices. Other variants of the Note 8 come with Samsung’s own Exynos 8895 Octa-core chip. In the area of security, the Note 8 has a fingerprint sensor, Iris scanner, face recognition and the normal Android locks. The Note 8 comes with Samsung’s Bixby which almost beat Siri and Google assistant in real life tests due to its firm integration with third party apps. Here’s a video comparison between Apple Siri, Google Assistant and Samsung’s Bixby. You also get Knox protection: real-time device monitoring and protection, virus, malware prevention (Powered by McAfee), Secure Folder: a secure space on the device to keep content such as apps, photos, movies, and files private using either iris scanning or fingerprint scanning, and Samsung secured payment integration. On the storage front, the Note 8 either comes with a 64GB, 128GB or a 256GB internal storage and also has a micro SD card slot. The Note 8 uses Mali-G71 MP20 – EMEA and Adreno 540 for the Qualcomm variant. The Galaxy Note 8 has a whooping 6GB of RAM to carry out all the most processor intensive tasks. The Galaxy Note 8 scored 6,564 in the GeekBench 4 performance test above. This makes it one of the fastest smartphones in 2017. Until the Snapdragon 845 is released and featured in a device, maybe the Galaxy S9, the Note 8 is just the fastest for now. The Galaxy Note 8 will cost about $929.99 to $1,195.11. And here comes the OnePlus 5 as one of the fastest smartphones in 2017. One of the most physical attractive feature of the OnePlus 5 is it’s build quality and slimness. Let me quickly spell out it’s powerful and interesting features. storage/expandable storage. It has a whooping 4GB/8GB of RAM and is powered by the most powerful processor currently on Android devices,Qualcomm Snapdragon 835. It doesn’t give its competitors a run when it comes to the display. It spots a 5.5 inches Optic AMOLED screen(~73.0% screen-to-body ratio) with a resolution of 1080 x 1920 pixels, 16:9 ratio (~401 ppi density) with a Corning Gorilla Glass 5 for more protection.Although the OnePlus 5 has a very powerful camera combo, it didn’t do well in real life situations especially in low light situations. The OnePlus 5 has a dual camera setup: 16 MP, f/1.7, 24mm, EIS (gyro) + 20 MP, f/2.6, 36mm, phase detection autofocus, 1.6x optical zoom, dual-LED flash camera that can take stunning photos and shooting videos with huge clarity. Below is the Geekbench score of the OnePlus 5 Android smartphone. All of these powerful features are geared on a .3.300mAh Li-Po non removable battery. The OnePlus 5 had a GeekBench 4 score 0f 6,542,almost the same with the Galaxy Note 8. The slate gray OnePlus 5 (with 64GB of storage and 6GB RAM) costs $479, while the midnight black version (128GB storage / 8GB RAM) is slightly higher at $539. The Sony Xperia XZ Premium is Sony’s flagship Android smartphone and so has a lot to offer. One of the most notable/outstanding feature of this device is it’s ultra powerful camera. It has one of the best camera on a smartphone and scored 83 in DxOMark smartphone camera quality test Also powered by the latest Qualcomm Snapdragon 835, the Xperia XZ Premium presents a stiff competition to its rivals in camera,performance, sound and other must have features. The XZ premium is powered by a 3,230mAh battery. The XZ Premium runs on Android 7.1 Nougat but will soon get the Oreo update. It has a 5.46 inches IPS screen(~68.4% screen-to-body ratio)with a frightening resolution of 3840 x 2160 pixels, 16:9 ratio (~807 ppi density). It features a Corning Gorilla Glass 5 on both the front and back to give you a real premium finish. Camera wise, the XZ Premium features a 19 MP rear camera( f/2.0, 25mm,EIS (gyro), predictive phase detection and laser autofocus, LED flash)and a 13 MP (f/2.0, 22mm, 1/3″ sensor size, 1.12 µm pixel size, 1080p) front facing camera. The Google Pixel 2 XL is the latest smartphone from Google, and you should expect nothing but the best. The Pixel 2 XL isn’t the fastest Android smartphone at the moment, but it’s fast and also has a lot to offer. The Pixel 2 XL camera gives the iPhone 8 Plus a fierce competion as well as other flagship Android devices. The Pixel 2 XL comes with a stock version of Android 8.0 Oreo. 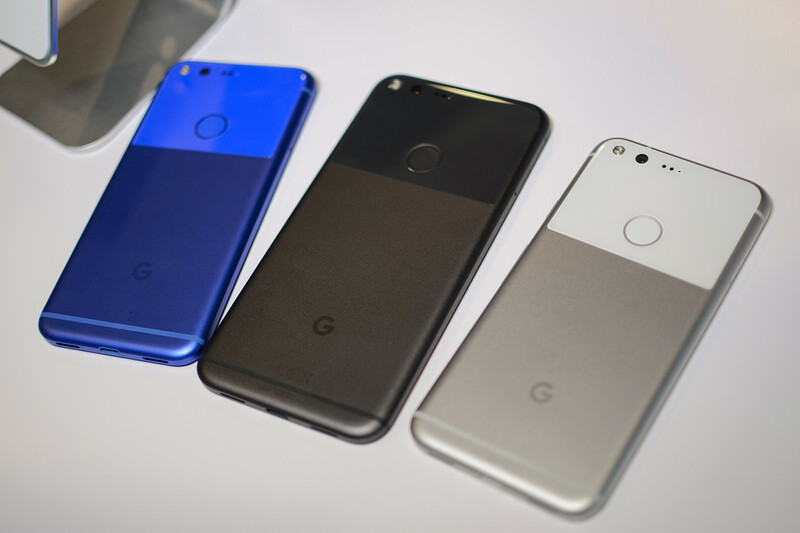 The Pixel 2 XL has a minimalist design, sports an Alluminium body with a glass window on the back. It has a 6.0 inches P-OLED capacitive touchscreen(~76.4% screen-to-body ratio) and a resolution of 1440 x 2880 pixels, 18:9 ratio (~538 ppi density) with Always On Display. It also features the Snapdragon 835 proccessor, sports 4GB of RAM and an internal storage of either 64 or 12GB space. It has a 12.2 MP rear camera(f/1.8, OIS, phase detection & laser autofocus, dual-LED flash) and an 8 MP selifie camera(f/2.4, 1/3.2″ sensor size, 1.4 µm pixel size,1080p). The fingerprint sensor is mounted at the back like many other smartphones. It’s powered by a non removable 3,520mAh Li-ion battery. Here’s an interesting video comparing the fastest smartphones in 2017 together for a camera test. Watch and decide.